SCOTTSDALE, AZ--(Marketwire - October 12, 2010) - When it comes to fashion, most will think Milan, Paris, and New York. But one of the most stylish, exciting events in the Southwest is the annual Scottsdale Fashion Week. As Arizona's ultimate fashion celebration, this high‐energy event celebrates fashion, lifestyle and fun with up‐and‐coming designers joining the runways with nationally and internationally renowned names. This year's event takes place the week of November 4 - 6, 2010, with the theme "Art of Fashion." Through November 1, 2010, the JW Marriott Camelback Inn® Scottsdale Resort & Spa is proud to offer guests a stylish, convenient package that gives them access and treatment usually reserved for models and designers! With the Scottsdale luxury hotel's Fashion Week Package, guests can celebrate the beauty and artistic nature of fashion with a one or two-night stay* that includes overnight accommodations in a casita guest room (Best Available Rate) and two VIP Tickets. Scottsdale Fashion Week VIP tickets include VIP access and seating to all five of Friday and Saturday night's fashion shows, VIP Lounge experience with food and beverage, gift bags on Saturday night and special offers from participating stores. All tickets will be purchased by Camelback Inn, and available at check-in. The Scottsdale Fashion Week Package is just one of the many Scottsdale resort packages and deals available. Reservations may be made online at http://www.marriott.com/phxcb using promotional codes XZEF or XZEG or call 1-800-228-9290 in the US and ask for promotional codes XZEF or XZEG. For more information on fashion week, visit www.scottsdalefashionweek.com. The recently refurbished and rejuvenated JW Marriott Camelback Inn® Scottsdale Resort & Spa offers a number of imaginative and contemporary features unrivaled by other Scottsdale resorts. At this renowned Scottsdale resort, guests can relax in the award-winning Spa at Camelback Inn, enjoy 36-holes of championship golf, or indulge in the fresh, new offerings at our Scottsdale resort's six restaurants, including Rita's Kitchen, R Bar, and the famed BLT Steak. 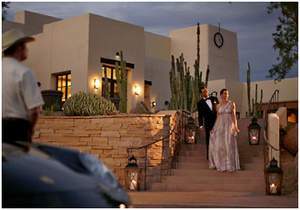 The resort's Scottsdale meeting and event space, outdoor venues and stylized private dining rooms provide unique spaces for groups of any size, from large corporate affairs to intimate soirees. A pleasing mix of the modern and traditional, and the most inspirational of Scottsdale luxury hotels, the Camelback Inn JW Marriott Resort in Paradise Valley is ready to welcome the next generation of guests. *Valid for stays November 4 through November 6, 2010, must be booked by November 1, 2010. Limited number of rooms are available for this promotion. Tax is additional. Offer does not apply to groups of 10 or more rooms. Offer cannot be combined with any other promotions. Blackout dates may apply. Advance reservations required. Other restrictions apply. Rates are per room, per night and based on availability at the time of reservations. A stylish, distinguished AAA five-diamond Scottsdale resort Located on 125 breathtaking acres backed by Mummy Mountain, the JW Marriott Camelback Inn® Scottsdale Resort & Spa features 427 luxurious guest rooms and magnificent amenities such as championship golf, an on-site spa and fitness center, and convenient access to shopping, Old Town Scottsdale restaurants, and more. This crown jewel of golf resorts in Scottsdale, AZ also features six on-site restaurants and lounges, as well as 20 meeting rooms offering 40,000 sq. ft. of exquisite meeting space.